Jim Husted at Hi-Torque Electric is the fellow that replaces the “magic smoke” in the KillaCycle® motors when we “let it out” by cramming to many amps, volts, watts, RPM, HP, etc. through the two 6.7 inch diameter motors that push the bike down the track at 168 MPH. As you can see in the picture, Jim keeps very busy rebuilding (and creating) EV motors both new and antique. Each of his motors is obviously a work of love and quality craftmanship. We are very grateful to Jim Husted for all the expert advice and “tricks” he has shown us that allow the KillaCycle to go as fast as it does on the track. We seem to show our gratitude by pushing his motors “just a bit” too far. We send back the blackened, plasma-burned, molten blob, remains of the motor, only to have it reappear on the doorstep of my shop a few weeks later, better than it ever was new. KillaCycle in Reykjavik, Iceland Sept 13th to 22nd! Unbelievable as it may seem, the organizers of the Driving Sustainability Conference, with the help of IcelandAir airlines, are shipping the KillaCycle® to Reykjavik to show at the conference and race on the one and only dragstrip in Iceland. We will be there from September 13th though the 22nd keeping our fingers crossed (and “holding our thumbs” as they say in that part of the world) hoping for a favorable weather window to run the bike on the strip. The KillaCycle® will be on display at the conference and I will give a presentation on the design of high-performance electric vehicles. The KillaCycle will be running exihibition at the All Harley Drag Racing Association, Northwest Nationals at Woodburn, Oregon on August 23rd and 24th. We will arrive on the afternoon or Friday, August 22nd and we might make a test pass that evening between 3 PM and 7 PM, depending on how smoothly the trip from Denver goes. Woodburn is a fast track and we will be set up identically to what we were in Pomona when we ran a 7.824 @ 168 MPH. Drop by the pits, chat, and have a cool drink on us. Buy a KillaCycle T-shirt prehaps. The KillaCycle will be racing at the All Harley Drag Racing Association “Southern Nationals” in Altlanta Georgia at the Altlanta Dragway on May 23rd though May 25th. (May 23rd will be test sessions.) We have made some improvements (we think) in the motors, so we are hoping to go just a touch faster this time. We will also be displaying the KillaCycle at the Advanced Automotive Battery and Ultracapacitor Conference and Symposia in Tampa, Fl from May 12th through May 16th in the A123Systems booth. We will guarantee that it gets on national TV! In the photos section, click on a thumbnail to get a large picture. Then click AGAIN on the large picture to get a high-resolution picture. You are welcome to publish any of the photos on the web site in an article about the KillaCycle and/or about the KillaCycle sponsor’s products. The KillaCycle made drag racing history at Pomona this weekend when we became the FIRST electric-powered vehicle to make a SEVEN-SECOND PASS in the 1/4 mile. The 186 lbs of A123 Systems Nanophosphate cells were all warmed up and ready to deliver the 500 HP they were designed to. We had been having some trouble getting this insane amount of HP to link to the track, so we were trying out a new brand of tire (27″ x 10″ M&H Racemaster) Our bet paid off when the bike linked up hard to the cold track and posted our best ever 60 ft time (1.14). The bleachers were quite full with folks that were waiting to see the KillaCycle make a pass. The bike sped by the stands, the only sound being the growl of the tire clawing for a grip on the cold track. 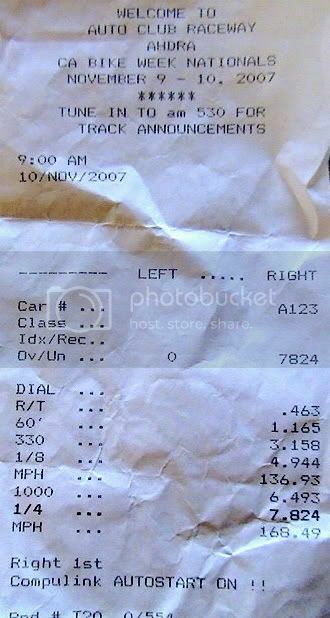 I knew it was a fast run, but we all were completely blown away when the board lit up with 7.82 @ 168 mph. The spectators didn’t clap or cheer, but, simultaneously, let out a revenant, hushed, low-pitched “whooooa” when the board lit up. They too were completely awed and nonplussed by the historic event that we all had just witnessed. The stars aligned for us, but we could not have done this without the support and encouragement of the Jonah at A123 Systems, Jim Husted at Hi-Torque Electric, John at M&H tire, Bob at NSK Bearings, Rich at Manzanita Micro, Otmar at Cafe Electric, Steve and Derek at Denver CNC, and John Bruszenski. We also want to sincerely thank the All Harley Drag Racing Association for their continued support and encouragement of our racing program. More information about it on the NEDRA web page! The KillaCycle will be on display at the A123 Systems booth at the EVS-23 (Electric Vehicle Symposium, 23) in Anaheim, CA Dec 2nd – Dec 4th. I’ll be at the EVS-23 too if you want to stop by and chat. The KillaCycle Team will be talking with Peter Boyles on the USA Biker Nation radio show on Saturday morning Oct 6th, at about 9 AM MST. You can hear the webcast at http://www.usabikernation.com/fabrication.asp or tune in in the Denver metro area at 760 AM. At the SAME TIME the NBC Today Show will be airing a segment on the KillaCycle! The episode of the Speed Channel is listed as either “Rapid Turnover; Speed Records”, or “Speed Records”. I’m Fine (scapes and cuts) Bike is a little bent…. First off, I’m just a bit scraped up. Embarrassed of course. I had not intended the bike to move in the soapy water, just spin the tire. Got it slowed down to about 20 mph. Front wheel is bent, as are front forks. Cowling is not nearly as pretty as it was. Battery box took a hit from the front wheel. Almost certainly, some cells were shorted. No smoke. No fire. Ultra safe cells. Had these been anything but A123 Systems Nano-phosphate cells, shorts would have caused a serious fire. No major damage. We will have it fixed in short order. Important to note: Area in front of the bike was CLEARED of ALL PEOPLE. NO ONE was at risk but me. Concrete on both sides of area.